Publisher’s note: This book was previously published under the title Reward of Courage. This is the second of a series by D. H. Starr, the first I’ve read, but Wresting With Love [Ai Press, 2011] is a stand-alone story and a good place to start. The basic story, written in third-person narrative style, explores the relationship between two gay young men, Derek and Scott, as it matures from high school into college. Although they both love each other very much, they have quite different attitudes. Derek wants to express his love and sexuality freely, while Scott is more reticent—preferring to keep his expressions private. Enter the mischief-maker in the person of Tyrell Jackson, a gay-activist, who has designs on Derek and not willing to take “no” for an answer. Altogether it’s an interesting, complex story that the author weaves very well. In fact, D. H. Starr is a superb craftsman when it comes to the written word. His journalism is top notch, his ideas flow consistently, and his understanding of the characters comes across as real. However, for my taste the pace was frustratingly slow in places, sometimes devoting one or more pages to a point I found only passsingly relevant. Having said that, the pluses far outnumber the quibbles and I have no problem in enthusiastically recommending this story. Four stars. 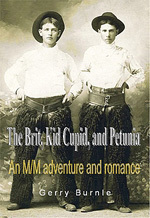 Be an alpha read er: Read an excerpt from my in-progress novel, The Brit, Kid Cupid, and Petunia, an M/M light comedy and adventure tale, and add your comments at the bottom of this page, or email them to me at: gerryb@gerryburniebooks.com. News: Two Irish Lads will soon be available in Kindle format. It is currently available in e-book format from iUniverse.